This year I tried my hardest not to put my dear husband over the edge by buying too much new holiday decor. My outdoor planters and decor I created using primarily free materials, (in case you missed it you can read that post HERE). For my indoor decor, I tried to also utilize things I already have, even if they weren't specifically Christmas decorations. First, I love the idea of using fresh greens, especially as a sort of table runner. Eucalyptus looks gorgeous and is all the rage right now, but if you aren't willing or able to fight the crowds at Trader Joe's, I think some greens from your own back yard will work just fine. Below you will see that I used some leftover pine tree trimmings. If you have long or short needle pine, cypress, boxwood, or even arborvitae - all of those greens would work as a base layer on your table. I have also ended up with quite the collection of brass candlesticks. My grandmother had some and I have scooped up a bunch at tag sales and consignment stores. Chances are you or someone in your family may have some, I personally think they look classic and lovely. I borrowed this reindeer figurine from my mom and then filled in the rest of the tablescape with pinecones, extra ornaments, and birch slices; all items I already had. I have a ton of mason jars and use them all of the time. I also end up over buying fresh cranberries because I use them in my holiday sangria. I saw an idea on Pinterest and decided to fill a couple of my mason jars with cranberries, stuck a taper candle and some pine sprigs in the middle and tied some twine around the jar to give it a more rustic look. Much to my husbands dismay, I also have a growing collection of glass vases in our basement. 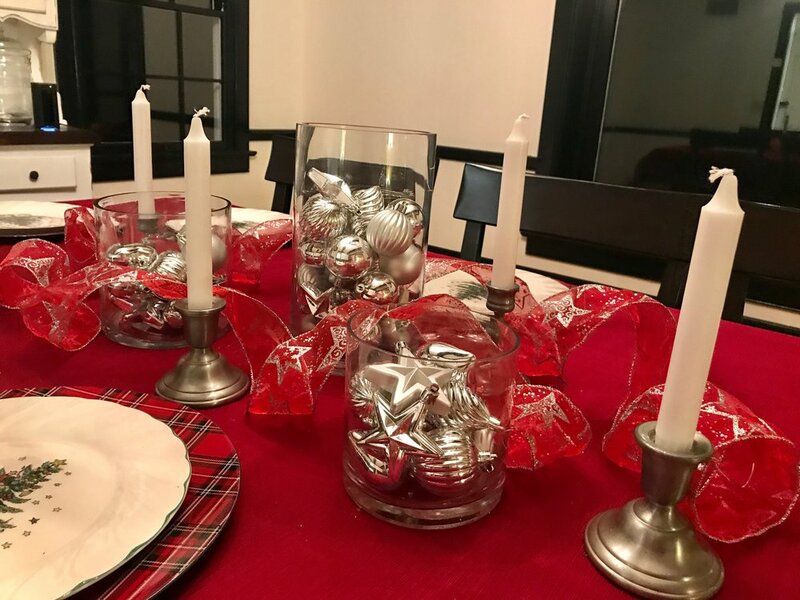 If you do as well, even if they are random and different shapes and sizes they look great clustered together and filled with glass ornaments. I included some silver candle stick holders which are also old and from my husbands grandmothers house to add a bit more elegance. As far as your dinnerware is concerned, I think regardless of what plates you use, even if they are paper, you can always dress things up when you roll your napkins and embellish them in some way. I saw this idea on Pinterest and thought it was great. I always have cinnamon sticks in my spice cabinet, and since they become old and lose their flavor, it makes sense to use them as a garnish. I tied a cinnamon stick to my napkin along with a sprig of fresh holly I cut from my neighbors holly bush. Another popular and very easy trend this year is wrapping gifts with plain old brown craft paper and then dressing it up with ribbon or twine and fresh greens. If you don't have brown craft paper you can use brown paper bags and they achieve the same look. I used leftover ribbon, red bakers twine, and regular twine all of which I already owned, to wrap my gifts. For fresh greens, I had a bunch of extra boxwood from my outdoor planter project so I just cut small stems of that and tucked them behind the ribbon. If you have extra random ornaments, ribbon or faux flowers/greenery, bows, etc. that you no longer have use for, stick them on your gifts; they really end up making a great statement! Moral of the story, use what you have. We are often inclined to go out and buy things, but I have said it before and I'll say it again, you don't have to spend a lot of money to create or have beautiful things, just takes a little rummaging and creativity. Hope everyone enjoys the holidays with the ones you love! !